Know the top traditional foods of India that tastes heaven and whose aroma reminds tourists of the country’s royal past and chic present. Undoubtedly India is one of the rare countries that offer a perfect combination of natural beauty, undying culture, rich heritage and linguistic diversity. 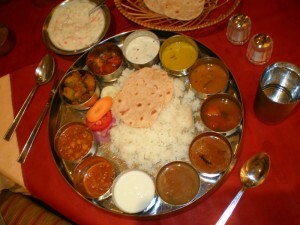 But this is not all what India has; it is the country that hosts a number of tasty cuisines from different states. So it is right to assume that tourists visit the country for its variety of dishes (after attractions and scenic beauty). If you are planning a trip to the country, the below list will help you choose the best traditional Indian cuisines. Dal-Bati, Ghevar from Rajasthan – The traditional Rajasthani dish usually consists of Dal-bati, Ghevar and Raabdi. Ghevar is a traditional sweet dish generally disk-shaped. On the other hand, raabdi is a dish made with flour, yogurt and bajre ki roti. The traditional Rajasthani dishes mainly consist of buttermilk that keeps the body hydrated. Taste the yummy dishes of the state! Aloo Paratha from Punjab – Paratha of any and every type is the specialty of Punjab. The famous Aloo Paratha (stuffed potato filling in the flatbread) is the original specialty of the state. Punjabis are known for eating fatty foods and this dish defines their style of eating. Aloo Paratha is made using pure ghee. Apart from Aloo, Punjabis make different type of parathas like Onion Paratha and Gobhi Paratha. Dine in true Punjabi style! Idli & Sambhar from Tamil Nadu – The specialty of South India, Idli and Sambhar are considered as the healthiest breakfast in the country. Idlis are cake prepared by steaming a batter of fermented rice. While the Sambhar is a liquid or vegetable stew. It is the healthy, cheap and scrumptious dish! Ilish fish paturi from Bengal – This dish is prepared in Banana leaf along with several spices. It is the pride of Bengal. The people of this state are spicy food lovers and prefer Ilish Fish Paturi with rice. You can taste a variety of fish dishes in Bengal. Karele and Baingan ki Lonje from Uttar Pradesh – Baingan and Karele lonje from Uttar Pradesh tastes yummy! A tangy mango powder and other spices are stuffed in the vegetables that enhance its taste. It is best served with puri or hot roti. Taste the UP specialty and enjoy the experience! Don’t miss the taste of these states. Book flights to India to experience the beauty and taste of the country. More details on cheap flights to India are available online.